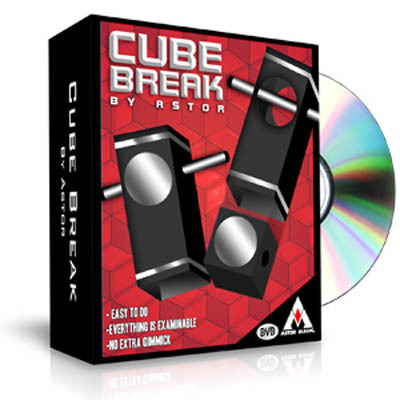 The Cube-break is an updated version of a classic. The Magician drops a cube into a prism. The cube has a hole running through it and is visible through the window of the prism. The cube is then held in place by a magic wand which is pushed through the holes in the prism and cube, locking everything into place. The presenter counts to three, the cube magically penetrates through the magic wand and falls into the palm of the Magician. Everything can be examined before and after the trick. There is Nothing to find! You use no other items except for the three props; a prism, cube and a magic wand. This trick is very easy to perform and can be repeated immediately.